I was thinking about making this one with a gold tassel after watching the Simpsons! I love the way this one came out! And last but not least... FRANKENSTEIN'S MONSTER! ha ha eenodol! You know this borderlines animal cruelty --the expressions on your cats' faces are priceless! I love the fez!!! LOL! I love those! Especially the blonde pigtails...too funny! LMAO!! poor kitty..he looks so mad at you taking pictures......lol....like one of your kids when your showing baby pictures to a boyfriend/girlfriend. Oh my gosh this is too cute. I am hitting This Rocks. I love your cats' face in the pics so cute. 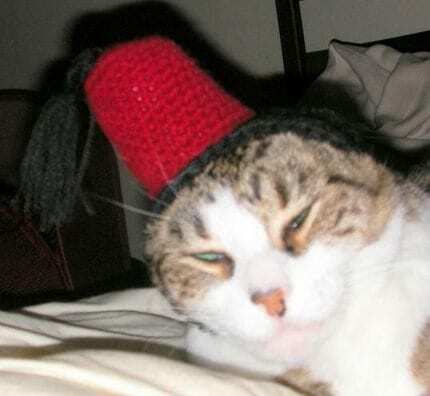 Heh, I'm glad I'm not the only one in the world who has made my cat a fez. I love the hair ones. 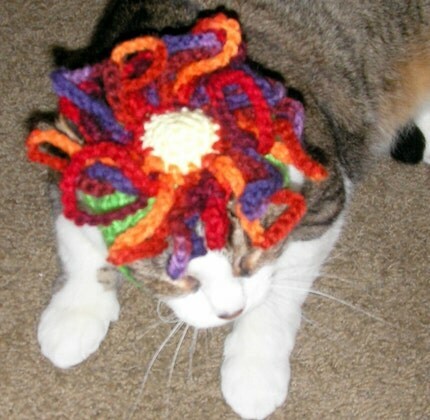 Does your cat try to duck down and run "underneath" of the hats when you put them on him? Mine always did that, heh. 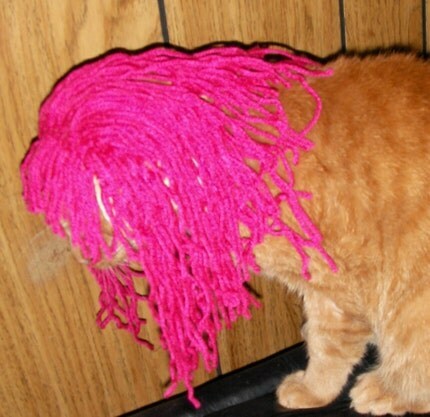 I love the fez and the long pink hair. If I tried to put a hat on our orange cat I'd lose an arm. Hey, can I have your permission to use these pics on Halloween cards? !